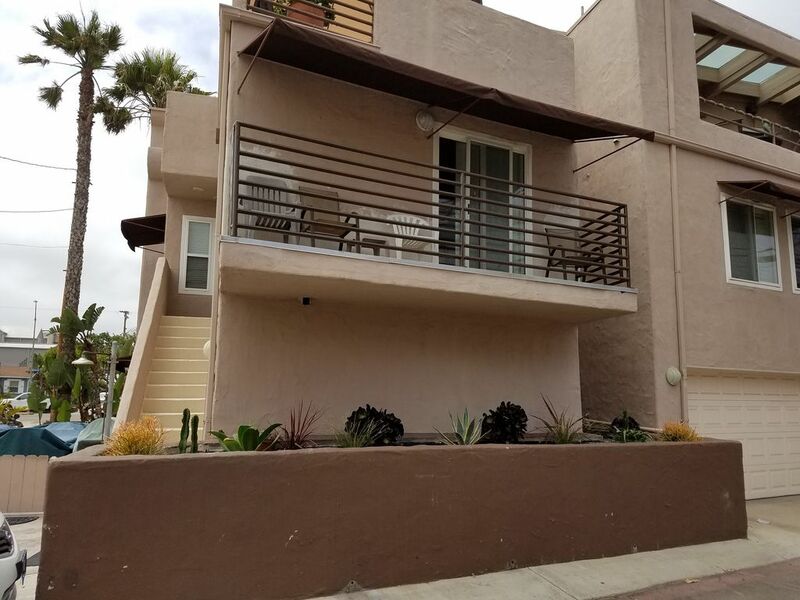 This beautiful Mission Beach condominium is located in a prime area of Mission Beach in San Diego. The condo has spectacular views of Mission Bay from our windows, balcony and upper deck. On our private balcony, you can enjoy boats on the bay and nightly fireworks from Sea World. Relax on the common deck with your family for your dinner BBQ and then watch the nightly Sea World fireworks. It is a wonderful place to relax and enjoy. Our bedroom setup is a king-size bed in the master bedroom and two twins in the second room. Each bedroom has its own full bath. We also have a sofa bed located in the living room and two futons. Whether you are on a family vacation or a romantic getaway, this is the ideal spot all year round. All of the San Diego attractions are nearby including: Sea World, Belmont Park, San Diego Zoo, Wild Animal Park, LEGOLAND, Birch Aquarium, San Diego Padres at Petco Park, Gaslamp District, San Diego Old Town, and Knott's Soak City Water Park. A great place to spend the day is in Balboa Park visiting the museums, Ruben H. Fleet Space Theater and eating at great restaurants. We love eating at the Prado. The world famous San Diego Zoo is a full-day of activity in itself. Disneyland is also only a 90-120 minute drive north to Anaheim if San Diego doesn't offer enough. Sports include the San Diego Padres located in East Village downtown. The very popular Gaslamp District offers wonderful nightlife and entertainment with acclaimed restaurants and chefs also located in Downtown San Diego. Seaport Village is also very popular for shopping and great restaurants located at the harbor. Little Italy is becoming the best area for dinning and offers a charming atmosphere. Liberty Station near the airport is a very short drive. Within walking distance from the condo you can walk to many restaurants, shops and farmers markets as well as the Historic Belmont Amusement Park. Jump on a bike and ride down to Pacific Beach, spend a day surfing, swimming, sunbathing or just relaxing and top it off with a casual dinner at one of the great beach front restaurants. La Jolla Cove and Shores is an absolutely gorgeous place to visit. There is always an option of just parking your car in our two-car garage and relaxing at our condo and enjoying Mission Beach. We are now booking dates for the end of Summer 2019 and fall 2019. Don't wait. Get the most popular dates now. Also one week in June and August 2019. We have owned and loved this property for over 20 years. It has been a vacation spot for us as well as a vacation spot for others. We enjoy having our guests stay for summer weeks and during the year. There are many activities close by but it is also very relaxing to just stay near the condo. We travel all over the world but love to stay in San Diego too. We stay in vacation rentals like ours when possible in our travels so we keep our rates low. Enjoy San Diego Mission Beach. Our unit features a great location for a wonderful vacation at the beach. It has comfortable beds and 2 separate baths for each bedroom. San Diego is a wonderful place to visit but the beach is the best. There are lots of water activities and attractions near by. The world famous zoo is probably the most visited site plus the Midway museum. Come bring the family for a great vacation. We are located in central Mission Beach. We love our location. There are beaches on both sides as well as a convenience store on our block. A new crosswalk with lights has just been installed for safety crossing the main street. Downtown San Diego is 15 minutes away. The ocean is only 5 houses away from the condo. The unit is only one house from the bay side of Mission Beach. The beach can be seen from the private balcony. Sea World can also be seen. The Pacific Ocean can be viewed from the upper deck. The Mission bay can be seen from inside the condo and from the private balcony, front porch and upper deck.. Dining is available in the dining area. There are also 3 barstools in the kitchen area. Smart TV including Netflix and Pandora. Pandora is on the TV. Kayak or canoeing is available for rent. Stand-up paddle boards are also available for rent. A common deck is available on the 3rd floor. boogie boards and sand toys are available. Many excellent golf courses are nearby. Wireless Internet, expanded Cable TV,DVR, 2-car Garage, BBQ, bikes, beach chairs, Boogie Boards, and umbrella. Ice-maker and all necessary appliances. Cute condo in an excellent location with very nice & accomodating owners. There was a small issue with the garage door opener when we first arrived, but the owners were there to remedy the problem within 1/2 hour and the rest of the stay was perfect. The owners are very nice and considerate people and extremely easy to work with. We had five adults staying in the condo for a week and it was just right. Not too crowded and plenty of sleeping/sitting areas for everyone to be comfortable. The location is very nicely located close to the bay area, and the ocean-side beach is not far away at all. The condo has more of the basic necessities already in it than any other condo I have rented in the past which was a very nice surprise. I would highly recommend renting this condo. I am already considering booking some time for next summer. Be warned there is no a/c. You may rarely need it in this location but we had the misfortune of staying during one of the hottest most humid weeks of the year and it was 85 degrees inside the condo in the middle of the night with all the fans going and all the windows open. That said, it was an excellent location, the place was clean and the rate is considerably less than many others in this area. Also note we were able to squeeze a large SUV and compact car into the garage. Good thing because street parking is impossible to find. These are just things to be aware of. The place is quite nice. Thank you for your nice review. An air conditioner is arriving today because it has been so humid this year. This is something that we didn't forsee in advance. The good news is that the water temperature is breaking all records too. Thank you f okr your review. For many reasons this place is great, especially the location. However it was advertised as having air conditioning, but it did not. The temperatures were in the high 80’s the during our stay. My sister’s family and I collectively had 3 kids under the age of 5, who slept miserably as a result of the heat. I would have chosen a different rental had I known it didn’t have AC. I reported my concern to the owner, Kathy, she responded with an apology, but stated she did not realize the rental was advertised as having air conditioning. However, she sent me an email only 2 days before we arrived, stating the unit did not have AC, why would she do this if she had not marked the unit as having AC? I wish she would have handled my concern more effectively. Katie, thank you for staying at our condo even though there was a misunderstanding about air conditioning. We have never needed air conditioning at the beach until this year. I have since ordered it and it will be in next week. I apologize again for mismarking the listing indicating that we had it. I had not intended to state something that wasn't there. Again, thank you again for letting me know. Great location! Fun fun fun for our whole family. Perfect layout for our family! Stocked with everything we needed! Great location! We will be coming back for sure!! We are just steps from Mission Bay and a short block to the Pacific Ocean. Two boat rental centers are also very close. Lessons are also available during the summer. The two boardwalks are very convenient for walking, running, and biking. Mission beach is a very active area for outdoor recreation of all kinds. Historic Belmont Park is just blocks away providing restaurants and entertainment for all ages.